Ringling Bros. closing its doors was a major victory for the animals. But now, Ringling parent company Feld Entertainment has applied to ship eight of the tigers used by Ringling circus to Munich, Germany. We must act now to stop this! On Friday, May 26, 2017, U.S. Fish and Wildlife Service posted an application from Feld to re-export the tigers to their owner and former Ringling head trainer Alexander Lacey, care of Zirkus Krone. 1. CLICK HERE to leave a comment demanding that Feld Entertainment NOT be permitted to export the tigers to Germany, and that the animals instead be sent to sanctuaries in the U.S.! 2. Sign the petition at www.NoCircusCruelty.com demanding that U.S. 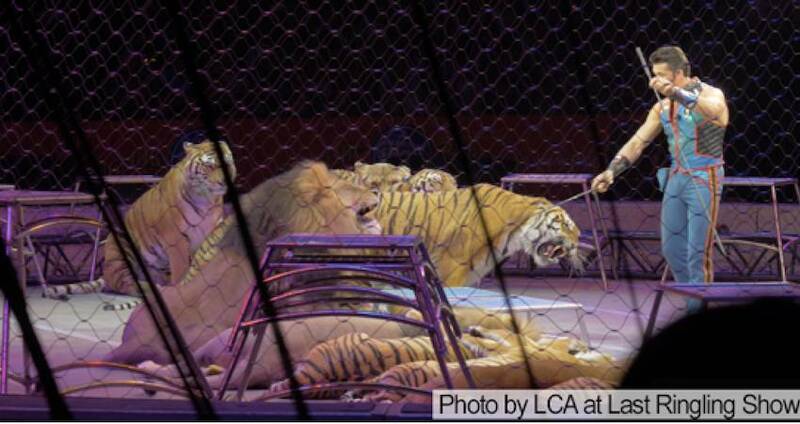 Fish and Wildlife Service deny the application to send 8 tigers used in Ringling's circus to Germany! In Munich, just like at Ringling Bros., wild and exotic animals are forced to travel from town to town performing demeaning and unnatural tricks for human entertainment. Lacey worked for Zirkus Krone before Ringling, and now it seems he wants to return there with his captive tigers. But life at Zirkus Krone will be no better than at Ringling for these majestic animals. LCA has reached out to U.S. sanctuaries and confirmed that there are good homes waiting for the tigers if we can stop the export! It is usually illegal to export endangered animals like tigers. But in the application, Feld claims that shipping these majestic cats to another circus will somehow “enhance the propagation or survival of the species;” and because the government is disturbingly lax about this requirement, Feld could get away with this deceit. Fortunately, the tigers' fates are not yet sealed. U.S. Fish and Wildlife Service has opened Ringling's application up to public comments, and will accept them thru June 26, 2017.